I discovered an incredibly useful resource yesterday - Mobclix. 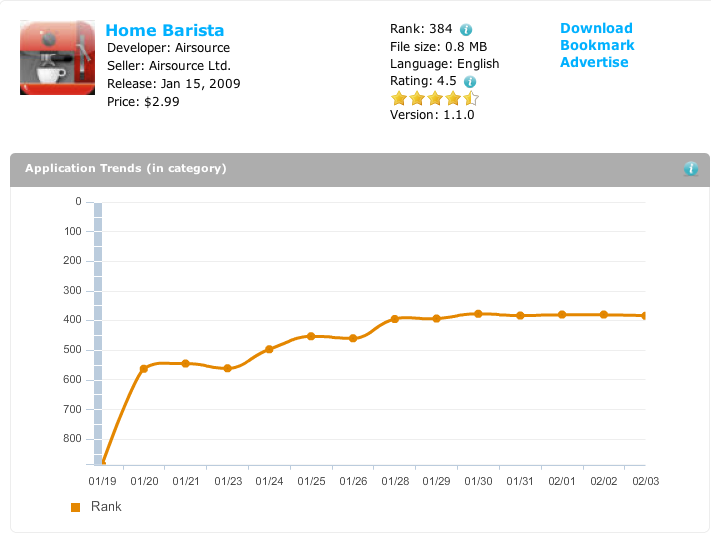 Among other things, they let you see a graph of how your iPhone App Store application - or anyone else's - is getting on. For instance, here's Home Barista. So I did a bit of playing around. 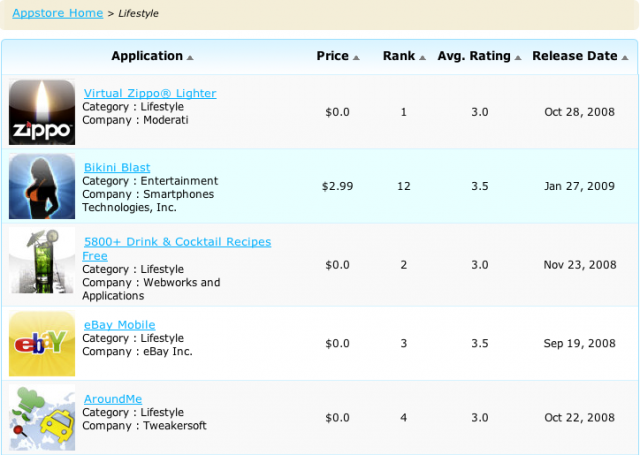 I looked at the following categories: Business, Lifestyle, Navigation, Productivity, and Utility, looking only at applications which listed those categories as their primary I excluded free applications, specified the US region, and noted the highest ranked 5* application, and the range of ratings of the top 10 ranked applications. The test was carried out between 10 and 10.15am GMT 4th Feb 2009. I exercised some arbitrary judgement when I felt that applications fitted better in a different category. There are some interesting things in these results. It looks like a 2* rated application can make the top 10. Looking at the actual reviews, though, all the recent reviews for high-ranked applications tend to be 4* or 5*, with very few low ratings. Taking Craigsphone as an example (9 in LIfestyle, 2*), the reviews are by and large very good, except for a couple of people who clearly can't work out how to turn the content filter off. Looking at the 5* rated applications, it's obvious that none of them are selling that well. Why? Well my suspicion is that someone who buys an app ranked 563 has looked for the app, and is going to read the description carefully to make sure it does what they want. Someone who buys from the Top 25/50/100 may well be buying on impulse, and is more likely to be disappointed because the application doesn't meet their expectations - and leave a bad review. In short, if you're successful, it's practically impossible to get a 5* rating. There's always someone who hates a star performer!